These are by far the easiest camp breads that you can make, and they are all delicious. Most of these recipes are for campfire cooking using Cast iron pans or a Dutch oven. The first example can also be cooked over a fire using just a green willow branch. This method is the easiest prepper bread of all, it is done by rolling out a long piece of the bannock dough between your hands, and wrapping it around a green willow branch then prop it above the coals, rotating it as needed. Even the kids will love this way of cooking there own bread. 1. Measure flour, salt, and baking powder into a large bowl. Stir to mix. Pour melted butter and water over flour mixture. Stir with fork to make a ball. 2. Turn dough out on a lightly floured surface, and knead gently about 10 times. Pat into a flat circle 3/4 to 1 inch thick. 3. Cook in a greased frying pan over medium heat, allowing about 15 minutes for each side. Use two lifters for easy turning. Sticks will work, in a pinch. May also be baked on a greased baking sheet at 350 degrees F (175 degrees C) for 25 to 30 minutes. The beauty of this simple bread is it can be made sitting beside a fire just as easily as at home, and it takes only one bowl to make it. I like to have these dry ingredients pre mixed, so all I need to do is add water, and oil. You may even add dried fruit or berries or even dry cheese if you have some. I have even made this right in the Dutch Oven, by coating the bottom with flour first, and scrubbing it clean with an evergreen branch, and then simply adding some oil to the bottom, before baking. The next simple prepper recipe is biscuits’. These can be made in a cast iron frying pan with a lid, as well as a Dutch oven. The simplest camp biscuit is not much different then the bannock, but with a twist if you have this ingredient. Add the mayo, milk, and stir until soft dough forms. Roll or pat out and cut with any cup or glass. Arrange the biscuits in your greased pan or Dutch oven and bake for 12 minutes. The simplest way to bake with a fire is by scraping aside some coals to place under your pan, and banking additional coals around the outside and the top of your cast pan. A truly good cast iron set, has a lip around the lid to hold the coals that are on top, and some Dutch ovens even come with cast iron legs. However, these tend to break off over the years. Next is a great camp bread, and very easy to make. Tortillas can be used with all kinds of filling not just Mexican styles. 1. Combine flour, salt, and baking powder in a bowl. Mix dry ingredients until well combined. Add oil and water until the mixture comes together and begins to form a ball. Continue to mix until dough is smooth. I like to do this with half the flour making a batter, and then add the additional dry ingredients until a smooth ball is formed. 2. Transfer from mixing bowl to a well-floured work surface. Divide dough in half, then in half again. Continue until you have 16 fairly, equal portions. Form each piece into a ball and flatten with the palm of your hand as much as possible. If dough is sticky, use a bit more flour. Cover flattened balls of dough with a clean kitchen towel and allow to rest for 15 minutes before proceeding. 3. After rest period, heat a large pan over medium-high heat. Roll each dough piece into a rough circle, about 8 inches in diameter, keep-working surface, with rolling pin lightly floured. Do not stack uncooked tortillas on top of each other or they will get soggy. 4. When pan is very hot place one dough circle onto pan, and allow cooking about one minute or until bottom surface begins to brown. The uncooked surface will begin to show a few little bubbles. If tortilla is browning too quickly, reduced heat by raising pan or removing coals from under it. You can adjust a fire by pulling coals off to the side before you start and using rocks as legs under you pan. If it is taking longer than a minute to see the golden brown spots on underside of tortillas, increase heat a bit, by adding more coals. Flip to other side and cook for about thirty seconds. You will want the tortilla to be soft and have a few small golden brown spots on the surface. Remove from pan with tongs and stack in a covered container until all tortillas are cooked. This will keep them soft and pliable. 5. Wipe out the pan in between cooking each tortilla, if flour has started to accumulate. 6. Serve warm or allow too cool for later use. When you are ready, place a slightly damp paper towel in the bottom of a sealed container to hold the finsihed tortillas. 7. Then store in an airtight container or zip-loc bag these tortillas will keep well. Store at room temperature for next day or freeze them for long-term use. To freeze the tortillas, separate them with wax paper or waxed paper, or even newspaper in a pinch, and place in a zippered bag before placing in freezer. These are the most awesome tortillas, much better then store bought, and very useful for camp life, or when serving a meal around a campfire. 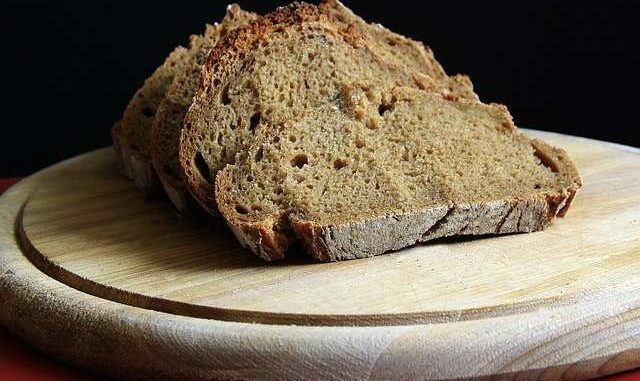 My next favourite bread is sourdough, the reason I have saved this for last is it requires the prepper to make it ahead of time, as the ingredient for raising your dough are what makes the sour part. This mixture is a self-rising concoction that you make yourself, out of flour, yeast, and sugar that grows continuously with fermentation. You simply take out what you need to use, and feed it with flour and sugar to keep it going. • 1 Tablespoon of dry yeast in a container of the warm water, and a tablespoon of sugar to feed the yeast. • 2 cups warm water mixture with yeast, wait unit it forms a head like a dark beer. 1. In large non-metallic bowl, mix together dry yeast that has been working in the 2 cups warm water, and 2 cups all purpose flour and cover loosely as this will be giving off CO2, and will explode if in a sealed container. 2. Leave in a warm place to ferment, 4 to 8 days. Depending on temperature and humidity of kitchen, times may vary. If this mixture gets to cold, it will kill the yeast and no longer create sour dough. Place on cookie sheet in case of overflow. Check on occasionally. 3. When mixture is bubbly and has a pleasant sour smell (Yeasty), it is ready to use. If mixture has a pink, orange, or any other strange color or tinge to it, THROW IT OUT, and start over. Wild strains of yeast are all around us, and some will destroy the yeast in your mixture. After creating it Keep it in the refrigerator, covered until ready to bake. 4. When you use starter to bake, always replace with equal amounts of a flour and water mixture with a pinch of sugar. So, if you remove 1 cup starter, replace with 1 cup water and 1 cup flour. Mix well and leave out on the counter until bubbly again, then refrigerate. If a clear to light brown liquid has accumulated on top, do not worry; this is only alcohol a liquid that occurs from fermentation. Just stir this back into the starter, the alcohol bakes off, and that wonderful sourdough flavor remains! Sourdough starters improve with age, they used to be passed down generation to generation! 5. Use this starter to make any Sourdough recipe. This is a quick bread and traditionally it was cooked in a Dutch oven. ~ Bacon fat or bear grease for later use. Mix the starter, milk, and one cup of the flour in a large bowl. Let this stand in a warm place over night to rise, or until ready. When ready, turn the mixture out on a flat area cover this first with the remaining flour. I like to make a pile and put an indentation in it to hold the soft mixture. Add additional dry ingredients, and if you are using honey dissolve it in some warm water first. Knead the soft dough by working it gentle into the additional flour until easily rolled out, or no longer sticky. Roll into a half-inch thickness, and cut into squares with a knife or round biscuit shapes using a cup. Dip each in the bacon fat, before placing in oven. Place as usual in a Dutch oven or arrange on a square pan, and bake for 30 minutes checking occasionally to prevent burning when using coals or a wood fire. For those of you that do not have cast iron cook ware yet, all one simply has to do instead is, before building your fire, dig a hole, and fill it with sand from the river bank or some fine gravel, then build your fire. First, establish a sufficient coal bed over the gravel filled hole (Usually within an hour or two). You will then scrape aside the fire over the gravel fill, and dig out a hot area large enough to place your camp pot into, then bank the pot with the removed hot gravel, covering completely the entire pot with the hot gravel. Add back the coals from your fire above the makes shift oven, and bake. This works for roasting meat or slow cooking stews as well. As for Bannock, it can be cooked just as easily by wrapping it around a green willow branch and propped above the fire, rotating it as needed. It is like roasting a marsh mellow. I like to use a stick with a nub of a branch still sticking out to keep the dough from spinning on the stick as you turn it. I also usually peel the bark off before doing this. Kids love to cook it their own as they sit around the fire, and whenever you can get kids to do some of the cooking DO IT! This keeps them from nagging the cook. They can even just mold it onto the end of their stick like play dough. It is called a pencil. Are you referring to the 20 survival items PDF? I ve got the same problem trying to download anything, however, the browser that comes with my phone has a small tab -to save for offline reading- this works for me. Granted, getting a good PDF reader would be a good deal, but when Adobe decided to only work when connected to the internet -twas nothing in the description of the upgrade- and started my hunt for a reader that operates offline. I live in an area that has spotty internet and I wouldn t have it any other way.